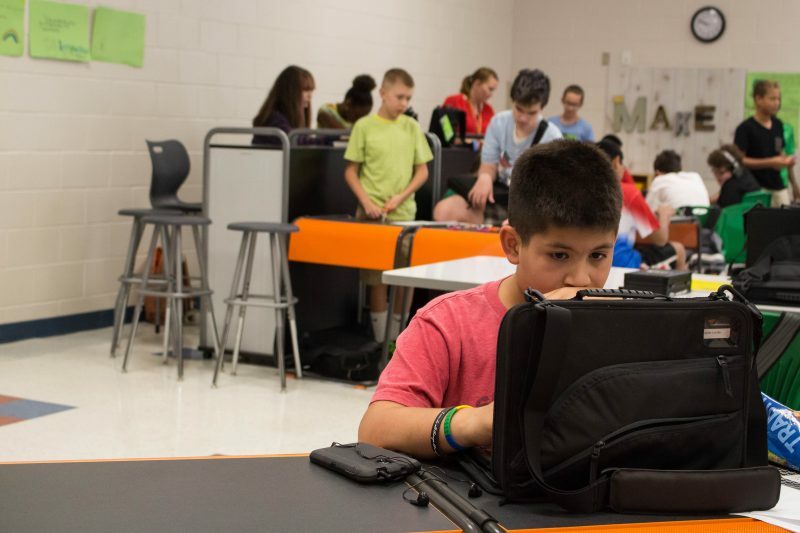 Must a classroom be high-tech to make personalized learning work? 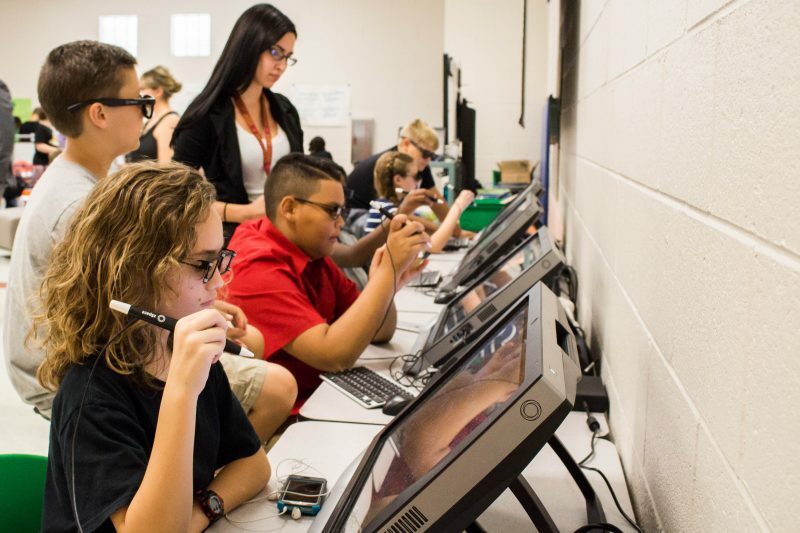 SURPRISE, Ariz. — The Innovation Academy workspace at Dysart Unified School District looked more like a tech startup’s headquarters than a classroom. On one side of the room, students wearing special tinted glasses studied electric circuits at virtual reality stations. On the opposite end of the bright, airy space, another small group of students experimented with piecing together real-life circuits that beeped, buzzed and blinked when connected. In the middle of all this activity, seventh-grader Jacob Higuera sat alone with his laptop, intently typing out a social studies assignment. It was only the fifth day of school, but he was already getting used to this unconventional classroom setup. He was enjoying being able to make his own daily schedule and having the freedom to work on lessons at his own pace. But Higuera, one of 90 sixth- through eighth-graders participating in the Innovation Academy pilot program this year, still had one big concern. While Higuera might feel like he’s on his own, his daily progress is closely monitored by the four veteran teachers who manage the program. The students spend much of the school day working on self-paced computerized lessons that generate data on their progress. The teachers keep a close eye on this data and use it to develop small-group activities that make the material come to life — such as working at the virtual reality stations — or to identify the students who failed to master the lessons on their own and pull them out for extra tutoring. In fact, it seems as if all eyes are on Higuera and his classmates as they pioneer what the superintendent of Dysart, Gail Pletnick, calls “the future of education” — a personalized learning environment that puts students in control of what, when and how they learn, with teachers as their guides. Pletnick hopes all the classrooms in the district’s 23 schools will look like the Innovation Academy someday. Right now, most do not. Many classrooms resemble a traditional setup, with a teacher at the front of the room and students sitting in rows, at desks, completing assignments with pen and paper. But even the most low-tech classrooms in the district have one thing in common with the Innovation Academy. Every teacher is encouraged to use “little data” — information collected daily or in real-time on each student’s academic progress — to personalize learning. 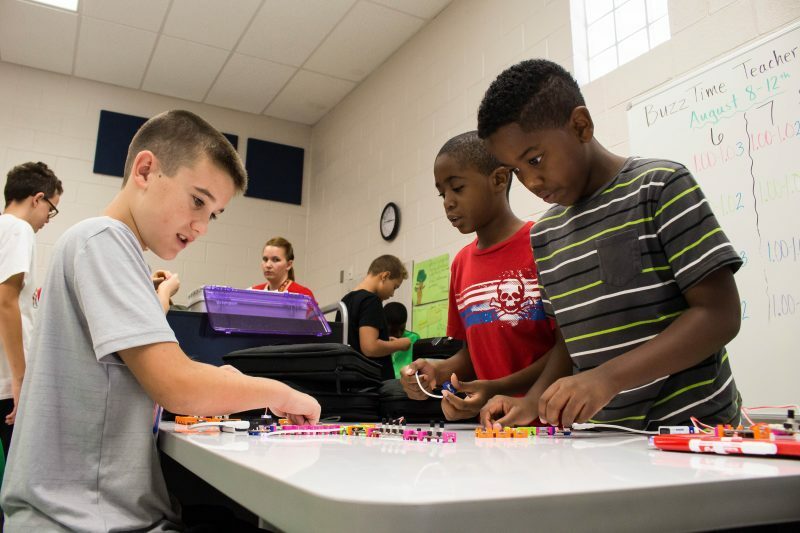 According to Bob Wise, president of the Alliance for Excellent Education, a nonprofit that advocates for high school education reform, little data — and how teachers use it — is the key to making learning as individualized as possible. Classroom technologies make it easier than ever to collect information on students. Now, teachers must figure out the best way to analyze that data and put it to good use. 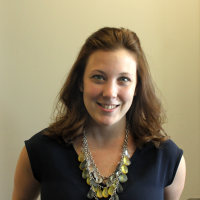 “We need to look at what data makes possible in the interaction between one teacher and one student,” Wise said. For example, big data analysis allows an online bookstore to recommend what a student might like to read next based on previous purchases and downloads she’s made. That suggestion is based on data collected from millions of other consumers and used to spot trends (a reader who likes history books might also be interested in historical fiction). But little data analysis can help the student learn something about her reading habits: Is she more likely to read more pages in the morning? Which words did she highlight to look up in the dictionary? How many times did she re-read the same chapter? A teacher can then use this little data to pinpoint the student’s exact strengths and weaknesses and develop a personalized learning plan to meet her needs. This is what the Dysart school district is hoping to do for every student, from the most high-tech classrooms to the most traditional. Dysart is one of the best-performing school districts in Arizona and has more than tripled in size since 2000. It currently serves more than 25,000 students. When Pletnick joined the district in 2004, she had to find a way to manage the surging student population and, with it, students’ different academic needs. At the time, the district’s internal boundaries were in flux, so the district also had to find a way to keep track of students who moved from one school to another each year. Administrators from Dysart visited a number of schools to observe how they collected and managed student data, but they ultimately decided to build their own three-part system, called iPAL (I Plan, I Assess, I Learn), to track the results of state tests and help teachers and administrators target and address students’ areas of weakness. “We saw bits and pieces of what we liked, but none of it was the Dysart way,” said Teresa Heatherly, director of curriculum, instruction and assessment. While the data-warehousing portion of iPAL is fairly straightforward, the system also includes resources for long-term curriculum planning and teacher training. But what iPAL doesn’t do is capture the little data teachers need to create daily lessons. For that, teachers work together to come up with methods of data collection and analysis that work best for their grade levels and subject areas. When it comes to collecting this little data, teachers at Dysart’s Innovation Academy have it easier than most. All of the coursework is online, so it’s not hard for teachers to pull up a student’s profile and check if they’re getting good grades on quizzes. They use the time saved by not having to plan lessons and grade papers to develop one-on-one tutoring sessions and other activities to give students other ways to explore the material. But teachers in the district who don’t have this online system are also coming up with creative ways to offer the same degree of individualized instruction to their students. For example, teachers at Marley Park Elementary School use a student data collection system the school calls “All Time Best,” which is designed to track students’ progress toward meeting state learning standards in math and English. 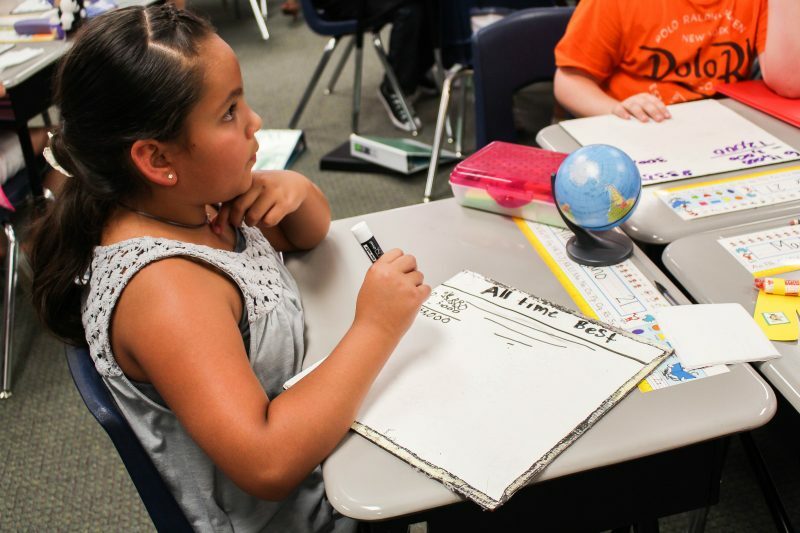 It’s a low-tech system that relies on students to report their scores by raising their hands if they got the question right and then graphing their results in their notebooks. According to Amber Baig, one of the school’s fourth-grade teachers, this system works because the emphasis isn’t on collecting large amounts of data; rather, the goal is to collect a small amount of meaningful data on each student’s progress toward mastering specific skills. Students in her math class only answer five “All Time Best” questions each day, and those questions match up with what they might see on a state test. Teachers then pool this data to split the students into smaller groups for more targeted practice. For example, teachers will re-teach lessons to students who are falling behind. “We make sure the kids know this, and know why they’re there, so they can test out of it,” Baig said. The data not only helps teachers develop more individualized instruction, but also helps the fourth-graders understand what they need to do to improve. Miranda Virgil, a seventh-grade math teacher at Canyon Ridge School, teaches her students to use Google spreadsheets to track their progress toward meeting state standards. With her guidance, students log their test scores and look for patterns in their mistakes. “The data tracking is more for the students when it comes to the specifics of it — to identify strengths and weaknesses and what they need to work on,” Virgil said. And even though she uses this feedback to craft better lessons, she’s also noticed that involving students in the process teaches them how to make their own choices about their education. But, as Virgil also pointed out, it’s another skill they have to learn. And they’re not always excited about that added responsibility or the freedom to control how they’re spending their time at school. Angela Ekstrom, a 10th-grade world history teacher at the district’s Valley Vista High School, came to a similar conclusion after sofas were added to her classroom this year. She thought her students would be excited. Turns out, they were pretty attached to the hard, cramped, traditional desks that lined the back of the room. “I don’t know if it’s an age thing, or if they’ve just been taught something over the years,” she said. The sofas were added to give students the freedom to choose where to sit and a chance to move around during the class period. No one dared to try them out until the second week of school. Ekstrom realized that the students are more likely to have the confidence to try something new — whether it’s a new seating option or a new study method — when they feel they have her support. At the beginning of the school year, her students assemble a sort of homemade textbook, complete with a table of contents, goal trackers and space to write notes and reflections. Ekstrom uses the notebook to teach students about different note-taking and study methods, and over time, allows them to use whichever method works best for them. But the assembly process, an arts-and-craftsy project in which students decorate their notebooks with photos of friends, family, favorite sports teams and anything else that’s important to them, serves a deeper purpose: Ekstrom uses it as part of an effort to show her students that she sees each of them as individuals, with different goals and strengths. All the data in the world, educators like Ekstrom and her colleagues at Dysart have learned, is useless if students and teachers don’t have a chance to connect on a personal level.